Astronomers have spent decades looking for something that sounds like it would be hard to miss: about a third of the “normal” matter in the Universe. New results from NASA’s Chandra X-ray Observatory may have helped them locate this elusive expanse of missing matter. 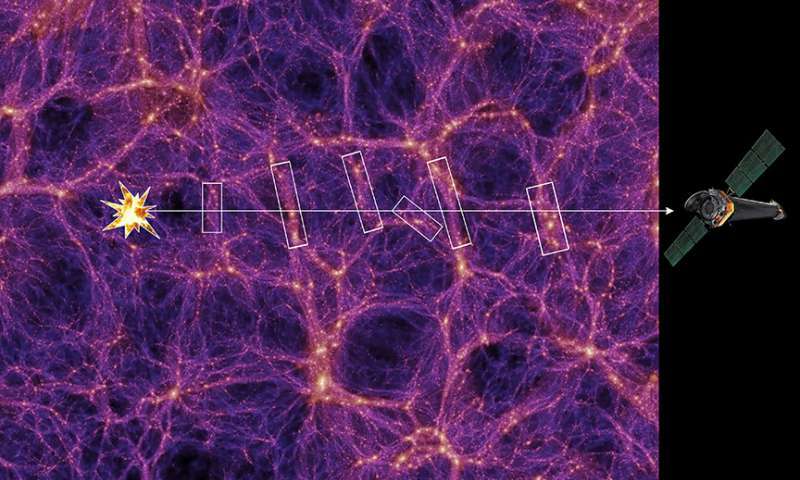 From independent, well-established observations, scientists have confidently calculated how much normal matter—meaning hydrogen, helium and other elements—existed just after the Big Bang. In the time between the first few minutes and the first billion years or so, much of the normal matter made its way into cosmic dust, gas and objects such as stars and planets that telescopes can see in the present-day Universe. One idea is that the missing mass gathered into gigantic strands or filaments of warm (temperature less than 100,000 Kelvin) and hot (temperature greater than 100,000 Kelvin) gas in intergalactic space. 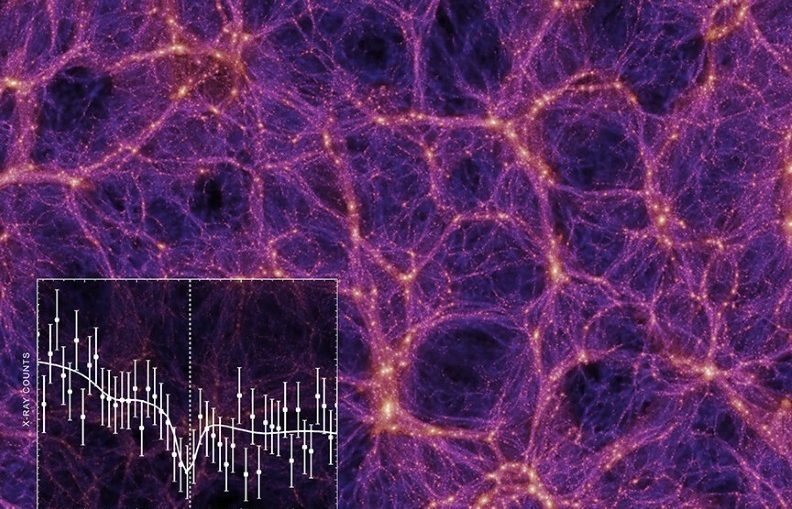 These filaments are known by astronomers as the “warm-hot intergalactic medium” or WHIM. They are invisible to optical light telescopes, but some of the warm gas in filaments has been detected in ultraviolet light. Using a new technique, researchers have found new and strong evidence for the hot component of the WHIM based on data from Chandra and other telescopes. Astronomers used Chandra to look for and study filaments of warm gas lying along the path to a quasar, a bright source of X-rays powered by a rapidly growing supermassive black hole. This quasar is located about 3.5 billion light years from Earth. If the WHIM’s hot gas component is associated with these filaments, some of the X-rays from the quasar would be absorbed by that hot gas. Therefore, they looked for a signature of hot gas imprinted in the quasar’s X-ray light detected by Chandra. Light Path (Credit: NASA/CXC/K. Williamson, Springel et al. One of the challenges of this method is that the signal of absorption by the WHIM is weak compared to the total amount of X-rays coming from the quasar. When searching the entire spectrum of X-rays at different wavelengths, it is difficult to distinguish such weak absorption features—actual signals of the WHIM—from random fluctuations. Kovacs and her team overcame this problem by focusing their search only on certain parts of the X-ray light spectrum, reducing the likelihood of false positives. They did this by first identifying galaxies near the line of sight to the quasar that are located at the same distance from Earth as regions of warm gas detected from ultraviolet data. With this technique they identified 17 possible filaments between the quasar and us, and obtained their distances. Because of the expansion of the universe, which stretches out light as it travels, any absorption of X-rays by matter in these filaments will be shifted to redder wavelengths. The amounts of the shifts depend on the known distances to the filament, so the team knew where to search in the spectrum for absorption from the WHIM. While narrowing their search helped, the researchers also had to overcome the problem of the faintness of the X-ray absorption. So, they boosted the signal by adding spectra together from 17 filaments, turning a 5.5-day-long observation into the equivalent of almost 100 days’ worth of data. With this technique they detected oxygen with characteristics suggesting it was in a gas with a temperature of about one million degrees Kelvin. By extrapolating from these observations of oxygen to the full set of elements, and from the observed region to the local universe, the researchers report they can account for the complete amount of missing matter. At least in this particular case, the missing matter had been hiding in the WHIM after all. A paper describing these results was published in the Astrophysical Journal on February 13, 2019.